There is something poetic about the word ‘Esora’. It has a lyrical tone when spoken, and the meaning —translated to “painting in the sky” from Japanese — suggests an atmosphere that is genteel, calm and artistic. These are precisely the qualities one encounters in the newest F&B establishment by The Lo & Behold Group in Singapore, housed in a shophouse along Mohamed Sultan Road. From the food, to the plating and environment, a holistic journey is crafted from entry to exit. The 26-seater Japanese fine-dining restaurant is helmed by Chef Shigeru Koizumi, whose experience at three-star Michelin restaurant Nihonryori RyuGin in Tokyo and two-star Michelin Odette at Singapore’s National Gallery segues into an authentic take on kappo cuisine – a multicourse meal where guests are served at the counter by the chef who decides on the menu. Modern cooking techniques such as the use of pacojets and liquid nitrogen result in inventive gastronomy and the option of a first-of-its-kind tea pairing takes the meal to another level. The restaurant’s name was chosen by Koizumi, whose fondness for the sky stems from growing up surrounded by nature. 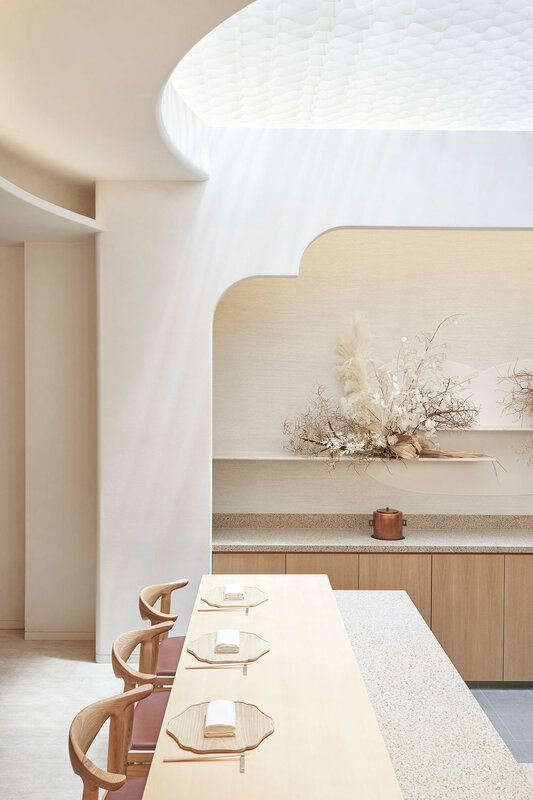 This fascination is most apparent in the skylight above the chef’s table and counter seats; dressed in a pleated cloud of Japanese washi paper, its honeycomb pattern washes diffused light down. In this ethereal mise-en-scène, light and shadow animate the surfaces in a gentle dance that transforms through the day. The setting is crafted by design studio Takenouchi Webb, who also designed The Lo & Behold Group’s other popular establishments, such as The White Rabbit and Tanjong Beach Club. The ability to fashion engaging narratives out of materials is the studio’s forte. Here, the palette is subdued but not without interest. Anchoring one end of the counter is a marble wall, whose sinewy veins inject visual movement into the stillness of the space. Emerald patterned tiles line the walls of the kitchen and tea preparation niche — their delicate size increasing the depth of space. Natural materials abound, reflecting the seasonal ingredients used. Plaster, timber and stone clad the surfaces while touches of marble and copper provide a more contemporary edge. 'The palette of materials is very restrained. We wanted a bright, modern feel. 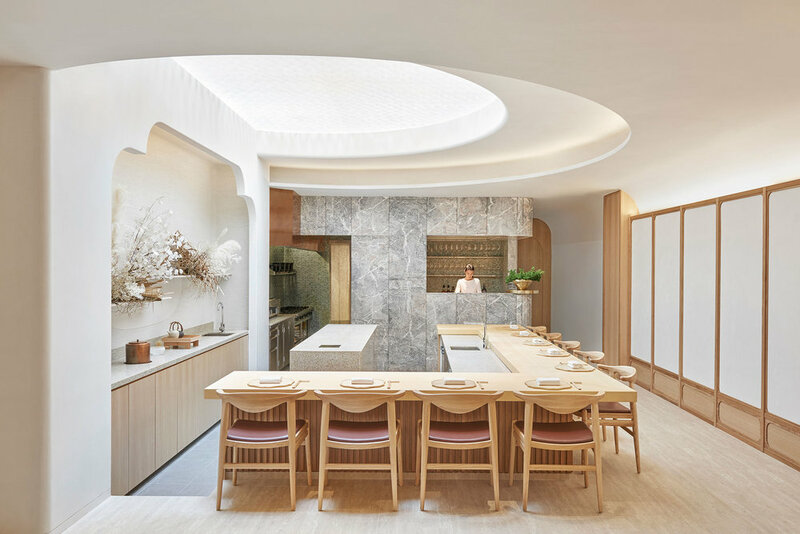 Modernised Japanese elements comprise timber grid screens with shoji paper effect, the wall behind the chef’s table, which has a very stylised tokonoma (display alcove) element, and the plaster with timber panels that line the wall,’ says the studio's co-founder Marc Webb. On the other side of the counter, a separate seating area can be screened off when necessary. Adjustments in screen design subtly demarcate the different zones and echo the rhythmic lines of the cylindrical stairwell behind this area. Throughout, rounded details continue the cloud motif. ‘We wanted to soften the space and so rounded the plaster corners of the walls and introduced a series of curved coves around the skylight. The effect of this gives an underlying calm to the restaurant,’ Webb explains. Other features contribute to the creation of a holistic experience, such as Tay Bak Chiang’s abstract painting Fringe, whose black singular imprint creates a focal point in the restaurant, and the design of a step down at the chef’s kitchen so the chef can be closer to eye-level with patrons sitting at the counter. 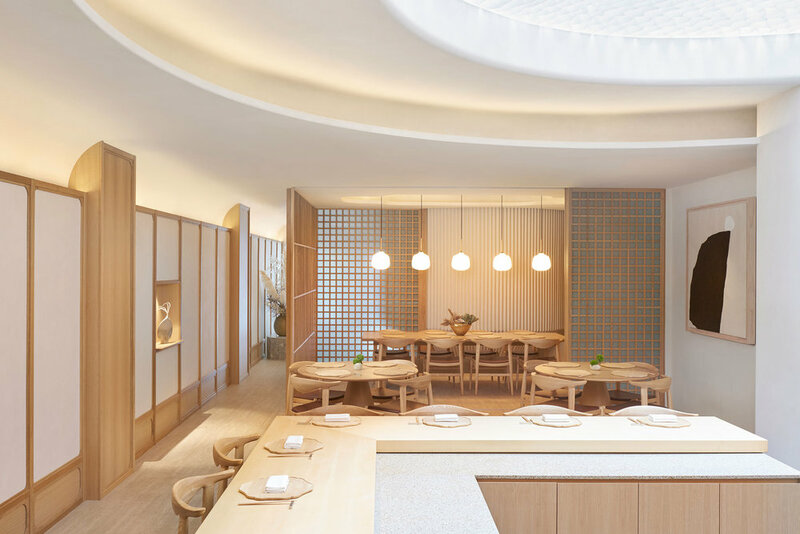 This reflects Koizumi’s one-degree approach — a term coined by the chef himself to describe the extreme level of attention to detail adopted throughout Esora.